Home » Blog » Spring has sprung! Here in the Northeast, spring has always been something of an anomaly. We usually go from freezing temperatures to 80 degrees completely bypassing spring. This year, however, we have been seeing more spring like temperatures. 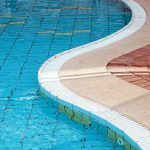 With spring, comes a myriad of weather and environmental factors that can affect your recently opened pool for the season. 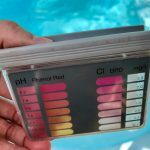 Here are some tips how protect your pool from…. Everyone knows the old adage: April Showers bring May Flowers. The showers also can bring havoc to your pool. Rainfall accumulating in your pool will dilute your water chemistry. Additionally, rain here in the Northeast tends to be on the acidic side which can bring down your pH rather quickly. Also, the dirt and bacteria that rain can sweep into your pool can aid in algae growth. Now, it is almost impossible not to get rain water into your pool. It is recommended to test your pool water after a heavy rain and to balance and treat you water as soon as possible. The tree pollen, ragweed, and mold spores that you are allergic to can also have a seasonal affect on your pool. Spring breezes can easily transport all this into your pool. This will affect your water clarity and filtration capacity, in addition to also affecting your water chemistry. When these allergens land in your pool, you want to try to get them out as soon as possible. Skimming your pool regularly will help with the surface. You may want to run your automatic vacuum more than usual to help remove the particles. Remember, your vacuum bag or filter may need to be cleaned more frequently because of this. Also, your filter media may need to be backwashed or cleaned from any buildup. When the warm weather arrives, humans aren’t the only ones who want to get outside and enjoy the warmth. Animals, rodents, and pests come out to eat and play in the spring! This can include them coming to play in your pool. When a bug gets into the pool, it usually will cause its demise. The bug usually gets caught in the skimmer basket, which can be easily dumped in the trash. Some rodents, like mice and chipmunks, took up winter refuge in your heater and filter. Your pool technician may find nest evidence for which a cleaning is recommended. If larger animals, like squirrels, wind up in your pool and don’t make it out, again you want to remove the animal with the skimmer net. Always use disposable gloves if handling pests and critters with your hands, so you can dispose of them after each use. 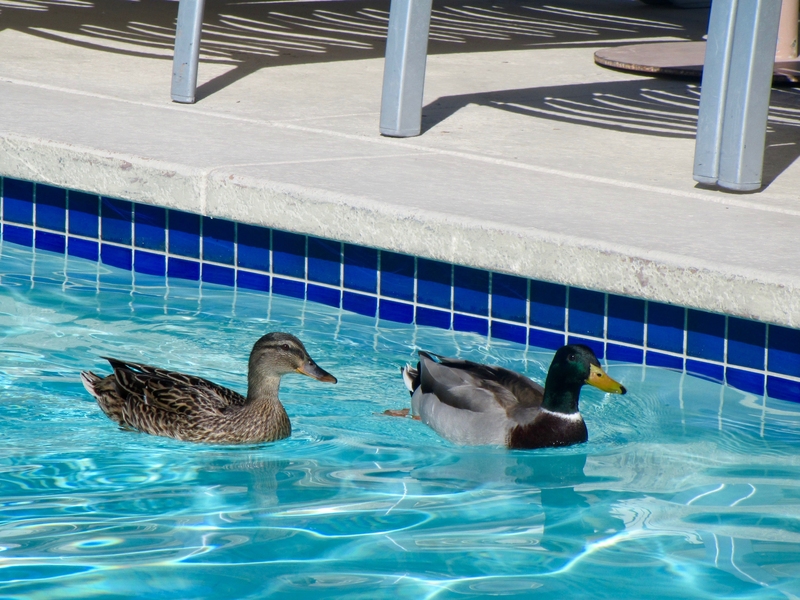 Some animals like geese and ducks like to use your pool as their pool. But, they didn’t get the message to not pee in the pool. Not to worry! The CDC has found that most bird droppings can be easily killed by chlorine, so a properly maintained and balanced pool is imperative. Do not vacuum any droppings, but use a skimmer net or bucket to remove it from the pool and place it back in the pool when treating the water so it too can become disinfected. So while spring has sprung, follow these tips to ensure that your pool doesn’t spring too far ahead off into the deep end of pool despair!